The funeral and, when Oliver can’t get up and give the eulogy, Laurel does. Wait! What? Yes the episode starts with a flashback to Tommy Merlyn’s funeral before we see the highly emotional events of the present day unfold. As the team start to wallow in their own self blame, all of them with guilt weighing heavy, the Black Canary uses the sonic device to take down some arms dealers and steal some guns. Wait! What? Yes, even I was slightly thrown by this revelation and wanted to do exactly what Quentin and Oliver did which was go to the morgue and check that Laurel was still dead. The Doctor is thanked by Oliver for her discretion and he mentions that the sonic device was stolen from Laurel’s belongings which the Doctor says was probably a young patient that hangs around the emergency room but, due to Doctor-Patient privilege, she won’t give him a name. It’s important to the team that they find this young girl, Evelyn, as she attacked Alex, the Mayor’s press person and Thea’s boyfriend, which gives Ruve Adams the excuse she needs to start slating masked vigilantes publicly and issuing arrest warrants, which the team don’t want as it is harmful to Laurel Lance’s legacy. Evelyn is an orphan whose parents died at Reddington as one of Damien Darhk’s experiments. She holds not just HIVE but the Green Arrow and his team responsible as she feels they left her to die. She goes to a Mayor’s meeting to try and kill Ruve but is talked out of it by Green Arrow who tells Evelyn what the Black Canary was really like. 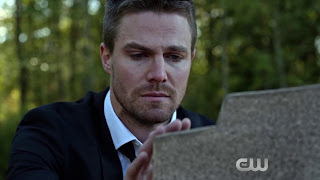 At Laurel’s actual funeral, Oliver announces to the world that Laurel Lance was the voice of the silent and wanted so much to save the city. He also told everyone that she was in actual fact the Black Canary and said that others should live up to her example instead of dragging her name and legacy through the mud. This week was highly emotional and watching Paul Blackthorne stumble around in a whole world of pain and desperation as Quentin brought many a lump to my throat. The flashbacks of Laurel and Oliver getting on and talking about Tommy brought many a lump to my throat. Felicity returning to the team brought many a lump to my throat. In fact it was only the very end where the flashbacks see Oliver returning to Lian Yu, and Felicity sitting in the Limo stating in no uncertain terms that Oliver must find a way to kill Damien Darhk that didn’t bring a lump to my throat. It made me want revenge too. There were brief cameos from Barry Allen/The Flash and Nyssa al Ghul that I think were there for more reasons than saying goodbye to Laurel and, in the coming weeks, Oliver is going to need all the help he can get from everyone he knows to take down Damien Darhk. "Do you know why I always blame myself in situations like this? Because at least it's an answer. Sometimes, we just need a reason when a situation is completely unreasonable."